If you own a home, then you are probably familiar with the dreaded task of painting. While there are hundreds of tutorials about how to properly paint a wall, there are very few mentions of just how messy DIY painting can be. It doesn’t matter how careful you are with laying down tarps and utilizing the blue painter’s tape, getting paint on your garments is inevitable. However, getting paint on your shirts and pants doesn’t mean you have to relegate the clothing to a specific drawer dedicated to specific clothes for home repair or even throw them out. 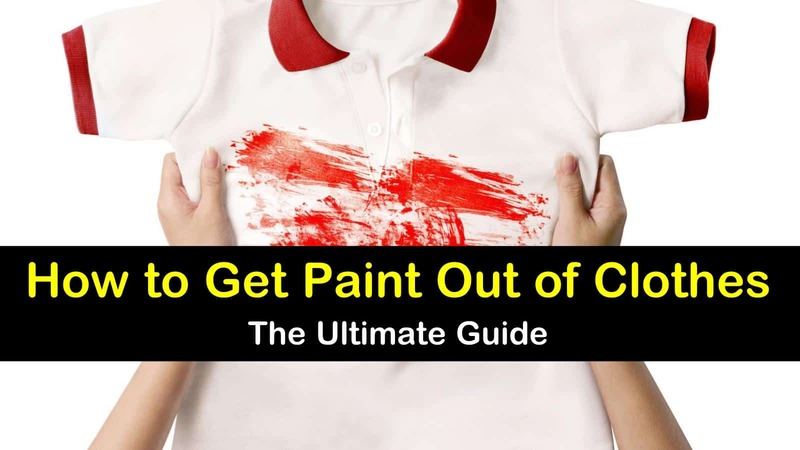 Here’s how to get paint out of clothes and save them from the garbage. Whether you are in the middle of a crafts project or DIY painting, there is a good chance that you’ll end up with some paint on your clothes. However, there is no reason you need to stress over the small mess. With a few simple tools and some time you can get dried paint out of clothes and get them looking as good as new. Here’s how to remove paint from clothes with smart cleaning tips and simple tricks. The first thing that you need to do when trying to remove paint from fabrics is to act quickly and treat the stain as soon as possible before they dry. Paint stains that have dried are much more challenging to remove. When dealing with latex paint stains, use a paper towel or clean cloth to blot up and scrape off any excess paint. Next, place the affected area under warm running water to flush out as much as the stain as you can. Next, create a simple but powerful stain remover that contains equal parts warm water and liquid dish soap. Before throwing the garment in the dryer, check to see that the paint stain is gone. If there is still paint visible on the clothing, you can use rubbing alcohol on a damp cloth to rub away the paint. Getting acrylic paint on fabric doesn’t mean the item is ruined. With a few simple products and some quick thinking, you can remove acrylic paints from your clothing. For the best results, it is essential that you act quickly to fix any damage that the paint may cause. Before you use the following method, be sure to test the mixture on an inconspicuous area to ensure you don’t damage the fabric further during the process. If the paint is still wet, try flushing as much of the paint from the clothing by holding the clothing under cold running water or soaking it in a bowl of cold water, until the discoloration begins to fade. When the water runs clear, tackle the remaining stain with a pre-treatment that is specially designed for stain removal. Throw the garment into the washing machine and wash it in lukewarm water, using high-quality laundry detergent. Cleaning the fabric in hot water could result in setting the stain. There are times when it isn’t possible to tackle paint stains immediately. When this happens, the acrylic paints can dry and form a plastic layer. It is very similar to when you try to get gum out of clothes. This makes them more like oil-based paint and can make it more challenging to remove paint from clothes. The first thing that you want to do is try to break down the bonds in the plastic layer. You can accomplish this by using inexpensive rubbing alcohol, nail polish remover, and even hair spray that contains alcohol. Dampen a cloth with one of the alcohol-based products and massage the stain. The color should start to transfer to the clean towel. It is essential to test this method on an inconspicuous area to check for colorfastness. Once you’ve compromised the plastic layer of the water-based acrylic paint, you can continue as above, treating the stain with a pre-treatment stain remover and washing as usual in lukewarm water. Oil-based paints are tough to get out of everything, including clothing. Fortunately, if you are dealing with oil paint, all is not lost. Here are some tips for getting oil-based paint stains out of fabric. If you happen to get splattered with oil-based paint, you have to act fast if you want any chance of getting the stain out. Keep the stain from spreading by blotting the area with a paper towel to soak up any excess liquid and paint. Look at the back of the paint can to see what cleaning solvents they recommend for removing spots, this will usually be a paint thinner or turpentine. Test the solvent on an inconspicuous area to ensure it won’t damage the fabric. If it passes the test, place the stained fabric over a generous layer of paper towels. Protect your hands with gloves ( see our how to get hair dye off your hands tips for details on protecting your hands properly) and be sure only to try to remove the stain in a well-ventilated area. Pour the solvent into a disposable can. You’ll also need to fill a bucket with a solution of equal parts water and liquid dishwashing detergent. Turn the piece of clothing inside out and place the stained area against the paper towels. Saturate a cotton ball and apply it directly to the stain. Once the stain is gone, place the garment in the bucket of soapy water to remove as much of the solvent as possible. Then, presoak the clothing in the washing machine, following up with washing and drying as usual. Removing paint from jeans is extremely easy and uses nothing more than some isopropyl alcohol and a clean cloth. Start by placing the paint-stained jeans on a thick bath towel. Then, begin pouring a small amount of the rubbing alcohol over the paint stain. Allow the liquid to sit for several minutes, then use a clean cloth or paper towel to scrub the stain. As the paint begins to dissolve, the stain will become less visible. Once the stain disappears, allow the jeans to dry so the remaining alcohol can evaporate. Then toss them in the laundry and wash with your regular detergent as usual. Getting paint on your clothes doesn’t have to be the end of the line for your favorite pieces of clothing. Instead of throwing them out or relegating them to your home improvement clothes drawer in your closet, try these simple techniques for removing paint stains from clothes. Just remember to avoid damaging your clothes by using an inappropriate method, know the type of paint you’re dealing with. 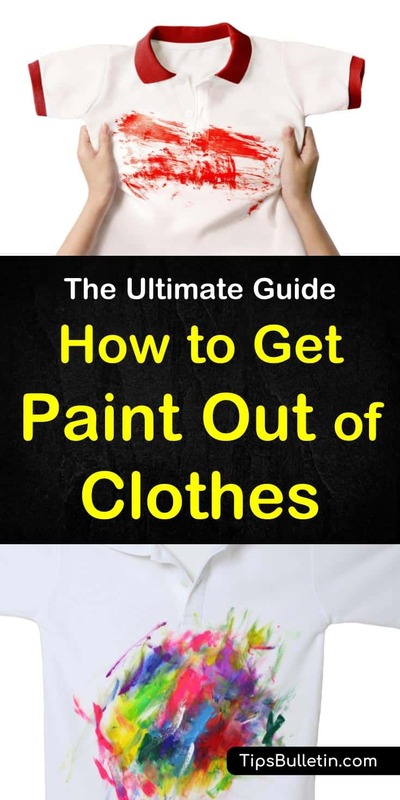 We hope you enjoyed learning about how to get paint out of clothes with simple techniques. If you found the information in this article useful, please don’t hesitate to share it with everyone you know.